Normally, a person would attribute that quote to someone like Johnny Winter, but the "Dr. Jekyll and Mr. Hyde" of rock has definite ideas about his music. In his concert appearance, January 16 at the Aragon, he showed why he is not only a favorite among fans all over Europe, but also of many musicians. 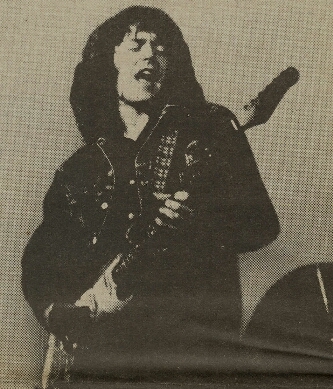 Rory has appeared on cuts in the new Rolling Stones album, and at one time was one of the few guitarists being considered to replace Mick Taylor upon his leaving the Stones. He was also one of the first people Muddy Waters selected to help him put together his London Sessions album in 1971. "Ah, it was fantastic! Just to sit in the same room with Muddy Waters was a big deal for me," said Gallagher. "I wasn't able to get any of his records until my late teen years, but I was well aware of him from reading about him. In Ireland, where I was living at the time, it was quite difficult to get Muddy Waters records." Rory has covered blues, as well as rock and boogie type music, on vinyl albums since 1969, first with the band, Taste, through his ninth and current album, Against The Grain, give samples of all those moods. But seeing Gallagher in action is really where it all comes into focus. Bearing the gutsy voice that goes so well with his style, the soft spoken young man I just talked with backstage becomes pure energy, screaming, running, skipping, leaping, all the while relentlessly pushing his beat-up '60 Stratocaster seemingly beyond its limits. Just as he's got everyone whipped into a frenzy, the rest of the band walks off the stage, and Rory picks up an acoustic guitar. However, this is no ordinary acoustic guitar. For this portion of the show, he has chosen his 1932 National Steele and goes into three great songs by three legendary bluesmen: Leadbelly's "Over[sic] The Western Plain", J.B. Hutto's "Too Much Alcohol", and Blind Boy Fuller's "Pistol Scupper[sic] Blues". These tunes soothe and relax, but before you know it, Lou Martin is back at the piano, Rod de' Ath is thumping the bass drum, Gerry McAvoy is laying down the heavy bottom, and as if by hypnosis, I am back up on my seat stomping again to the James and Bobby Purify rock number "I Take What I Want", and one of Rory's compositions "Souped-Up Ford". After two solid hours and two extended encores, I left physically exhausted and in rock and roll heaven. Thank God I had my stompin' boots resoled just in time!